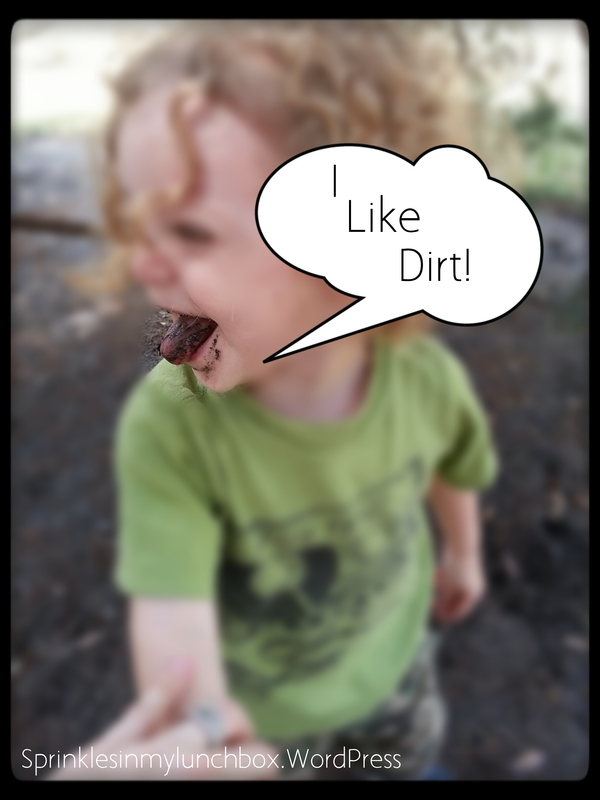 My younger son, Smalls, loves animal noises. I think most kids (smaller, in particular) do. He loves yelling “moo” when he sees cows, “noo-nee-noo-nee-noooo” when he sees a rooster, “wah-wah” when he sees a “kree-krat” [kitty cat], and “ribbit” when he sees….a turtle? Yes. In our house, for now, “ribbit” goes with both frogs and turtles, according to Smalls. Just as he’ll answer with “ham”, every time you ask him what is in his mouth, he’ll answer with “ribbit” when you ask him what a turtle says. But yesterday was actual frog day in Bigs’ class. Not the turtles that can be confused with frogs. 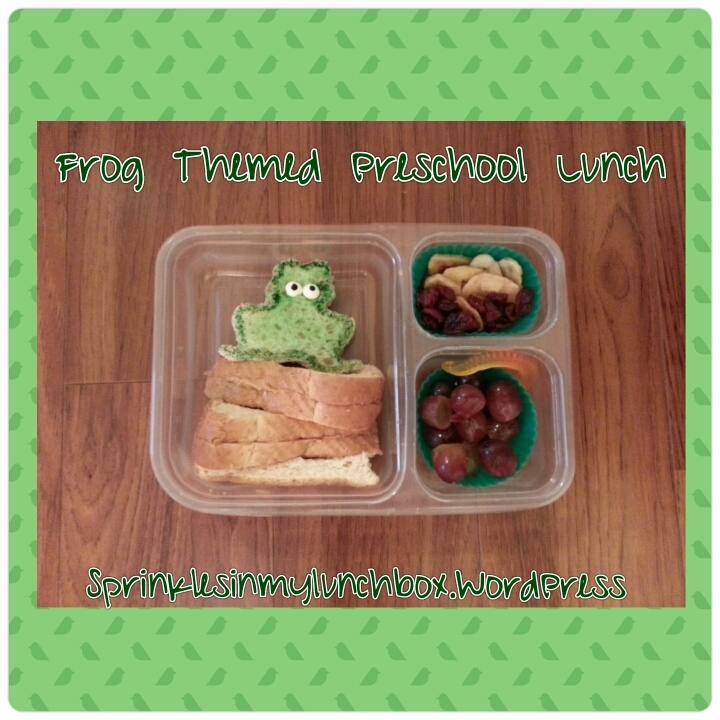 I made a frog-shaped PB&J, and let him sit on his crust branches. 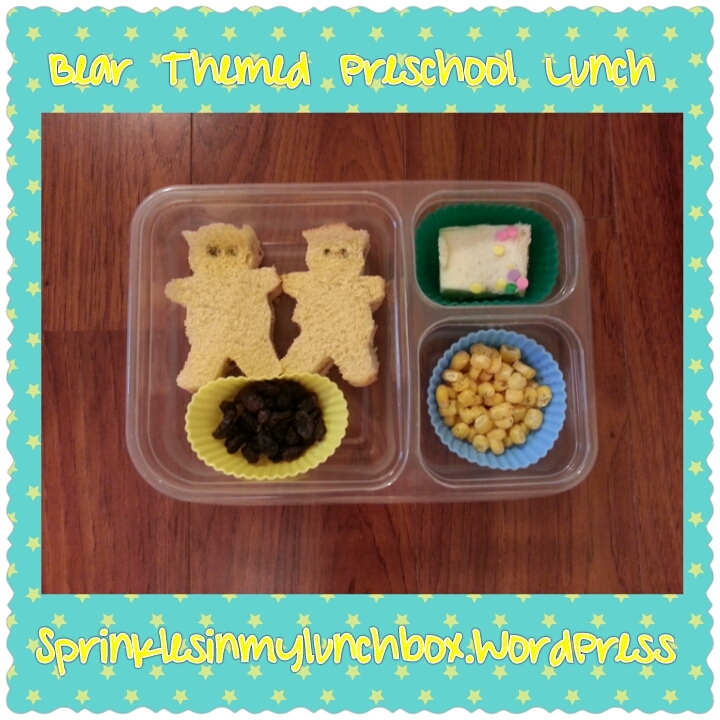 I also packed banana chips, dried cranberries, red grapes, and for dessert – a gummy worm. Frogs like worms. I think. Today is Sea Shore Animal Day in Bigs’ class! I LOVE under the sea and beach themed stuff (remember my Giant Squid master bedroom??)! For Smalls’ first birthday, I went with an under the sea theme. I think it’s darling. So, for Bigs’ lunch today, I made a crab! I made a crab-shaped PB&J. I colored it red and added eyes. I lightly sprayed the trimmings gold to make them look sandy. I also packed a corn and pea mix (we’ll see how this goes over – Bigs is trying to like peas), an applesauce squeezy fruit, and two rice krispie treat Oreos. 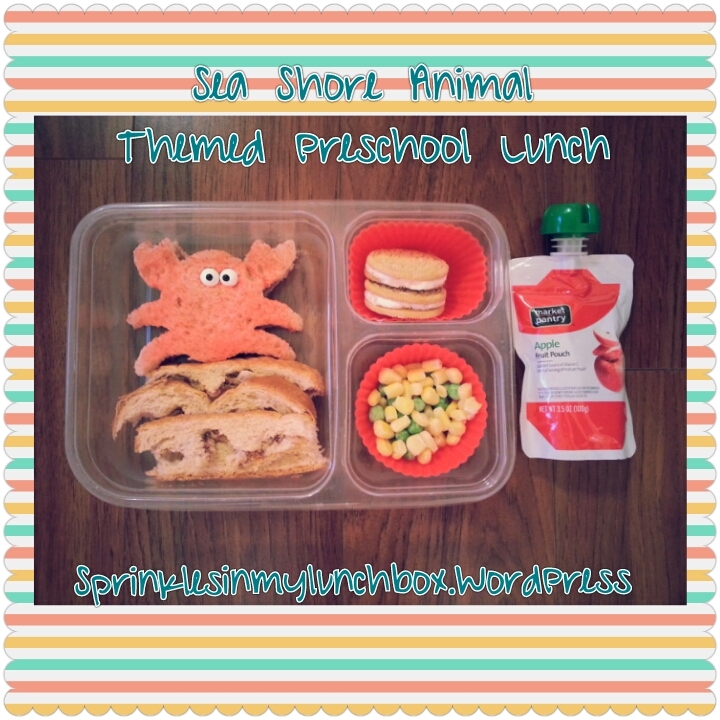 Hope your day is less crabby than this lunch! I have a small obsession. Well, it turns out a have a LOT of obsessions. But this isn’t about that. This is about this. I love the Giant Squid. It fascinates me. It’s gross, it’s huge, it’s elusive, it’s got a wonky eye. It’s so cool. My husband and I went to Washington D.C. for our wedding anniversary over five years ago. The one non-patriotic thing I insisted on us seeing was the Giant Squid in the Natural History Museum. It was too neat. Our master bedroom is done in shimmery turquoises, sandy tans, and creamy whites…and accented with a beautiful painting of the Giant Squid that a friend commissioned for me. Don’t judge. It’s beautiful. Anyways, I don’t (quite sadly) have a squid (giant or otherwise) cookie cutter. I do, however, have an octopus. 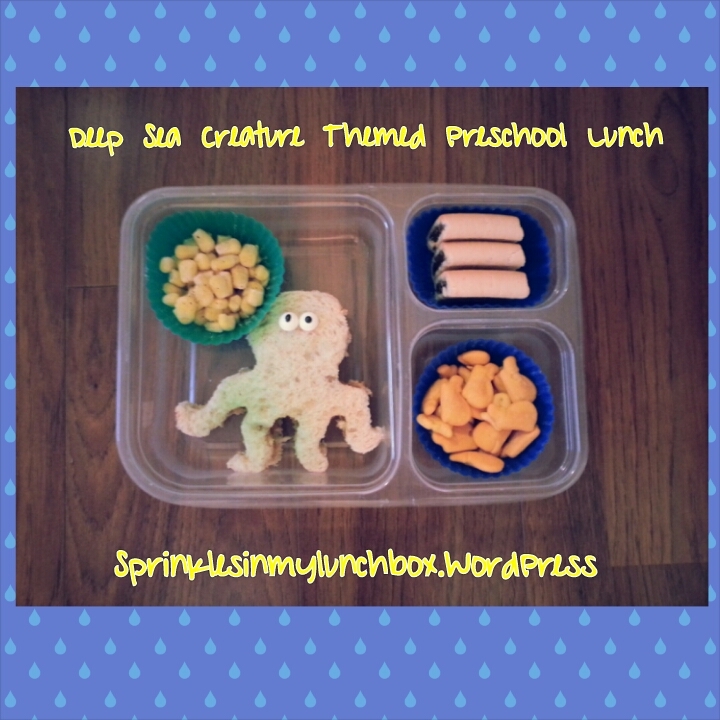 And that is what I used to make Bigs’ lunch for Deep Sea Day at school. I made an octopus-shaped PB&J. I sprayed gold and green for a shimmery, under the water effect, and used eyeballs. I also packed corn, goldfish and whale crackers, and fig newtons for dessert, which I later found out he does not like. And he thinks the insides are made of chocolate. Poor thing, to think there is chocolate he didn’t like. I love a good (or bad) pun, what can I say! May you feel the love in the sacrifice that Jesus made for all of us, today and always. This Easter week and a half have been so busy! I finally got around to starting a post. 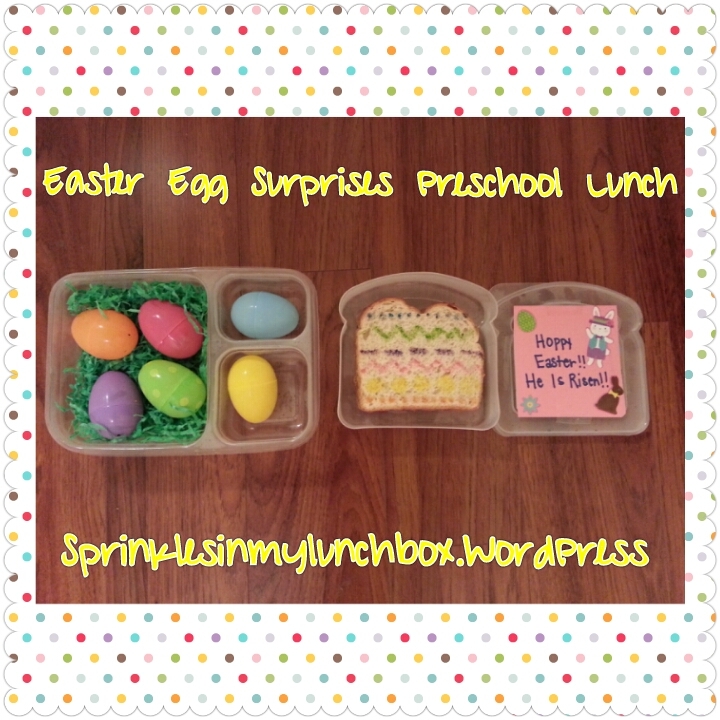 It’s been filled with lots of good food, lots of Easter eggs (some smashed…will get to that), and lots of fun. About a week ago, I went to a new to me restaurant. 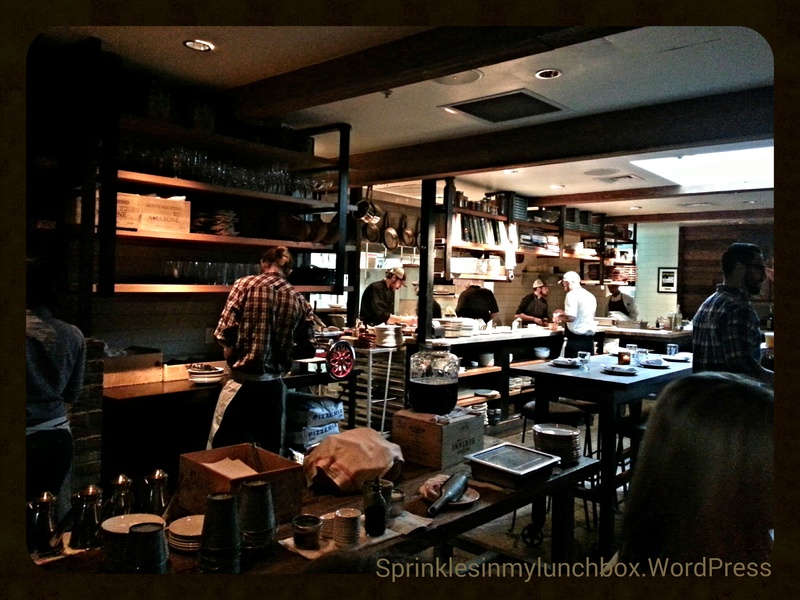 It was one that specialized in rustic Italian food, but with a modern, farm-to-table-esque atmosphere. We sat almost in the kitchen. 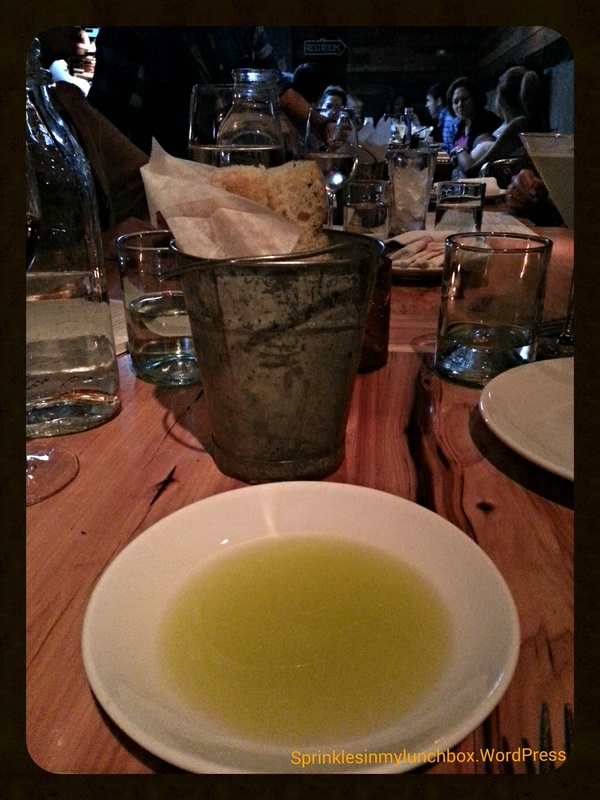 There was focaccia bread and olive oil. 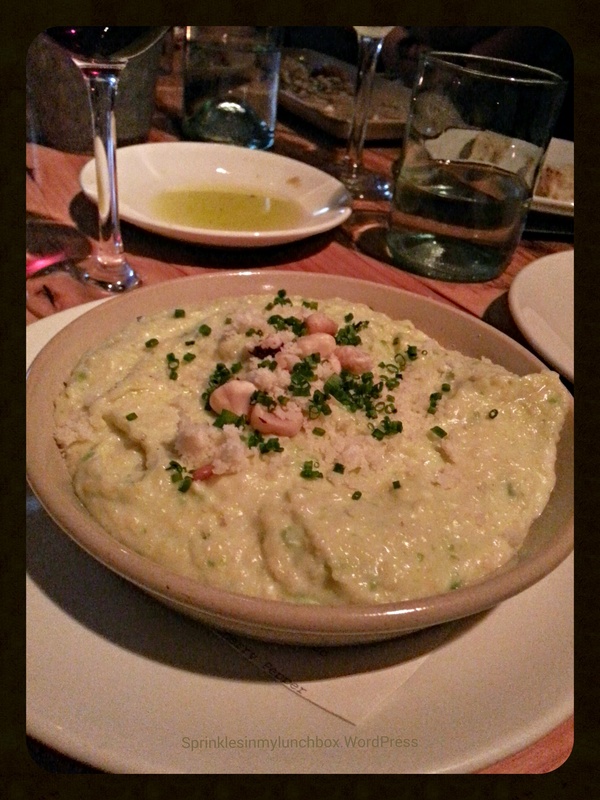 I ordered a side of polenta, which was creamy with mascarpone, mint, and hazelnuts, and chives. Serious comfort food. I almost licked the bowl. I’m serious. You can ask my friends. It was heavenly. 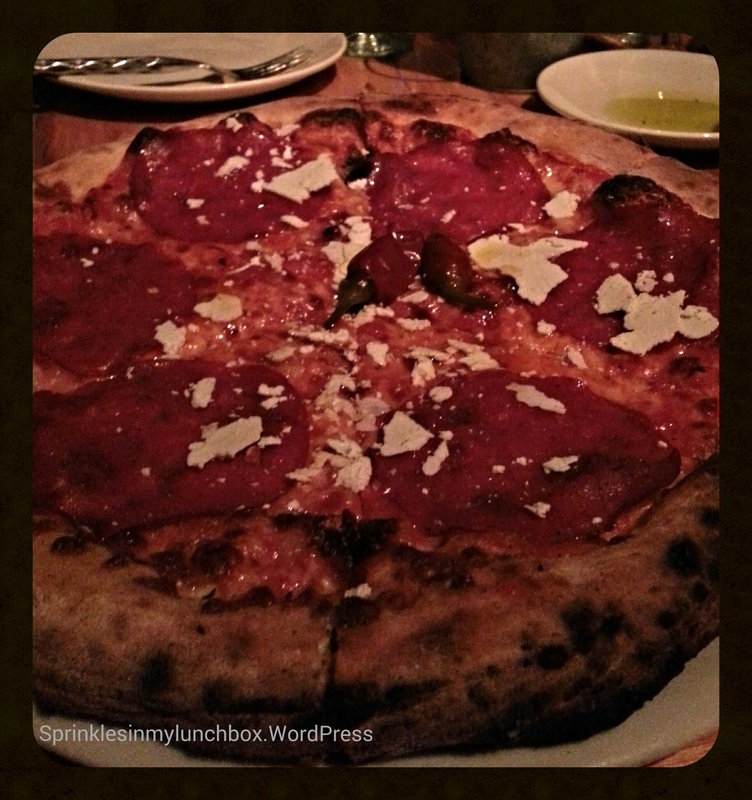 My friend and I shared the Diavolo Pizza (house pepperoni, Italian long peppers, oregano, and ricotta salata). Spicy and salty on an earthy crust. The next day, we had another playdate. This one goes down in the record books. It was a public library showing of “Frozen”, which we had not seen yet. When we first got there, we played while we waited. There were two hamsters that they boys loved looking at, especially Bigs, since he’d learned about mice earlier in the week. Then a boatload of kids showed up. There were about 25 kids from various schools and playdates, in addition to our playdate. My boys were good (as long as I was feeding them) for about a half hour. Then things went downhill, as they say. Smalls came up to me and pointed to his bum bum, saying, “Wet!!”. I have no idea how that even happened. I still don’t know if it was pee. 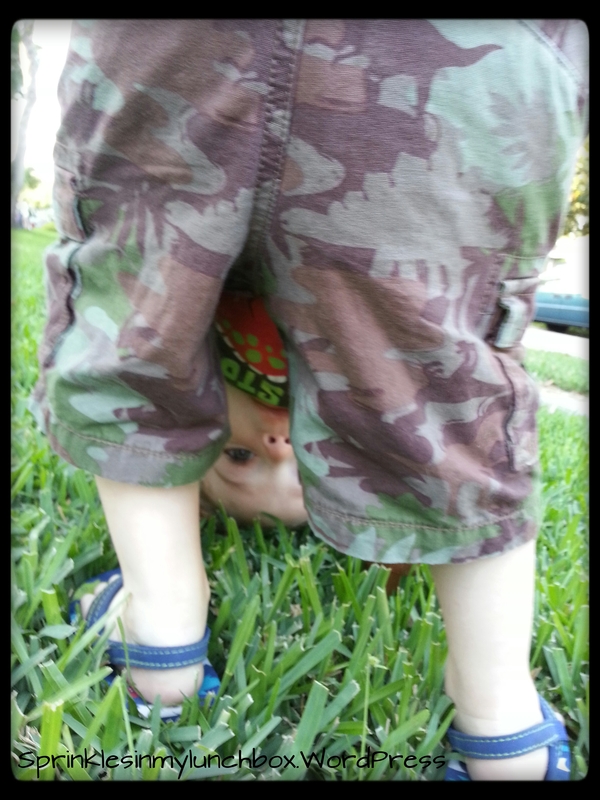 I didn’t have a change of shorts, so he rocked his mystery-liquid-soaked shorts. Then he fell off of an adult-sized chair and got a goose-egg on his forehead. And then things were just over. No more “Frozen”. No more library. We left. Sometimes, you have to know when to fold. That was a folding moment. We “Let it go”, as Elsa (?? or Anna??) sang. The top left is a carrot chicken salad, which was delicious. I loved the addition of carrots. 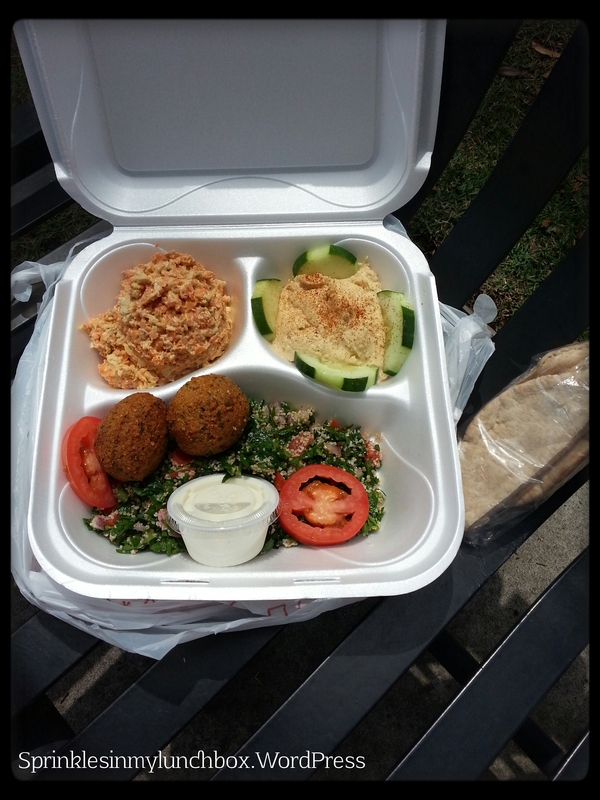 We also had hummus and cukes, falafel with a yogurt dipping sauce, and the most delicious tabbouleh I’d tasted, and some warm pita. That made wet pants and goose-eggs worth it. The kids ended up having so much more fun at the park than at the movie. There is this great, big, old tree in this park that looks downright magical. 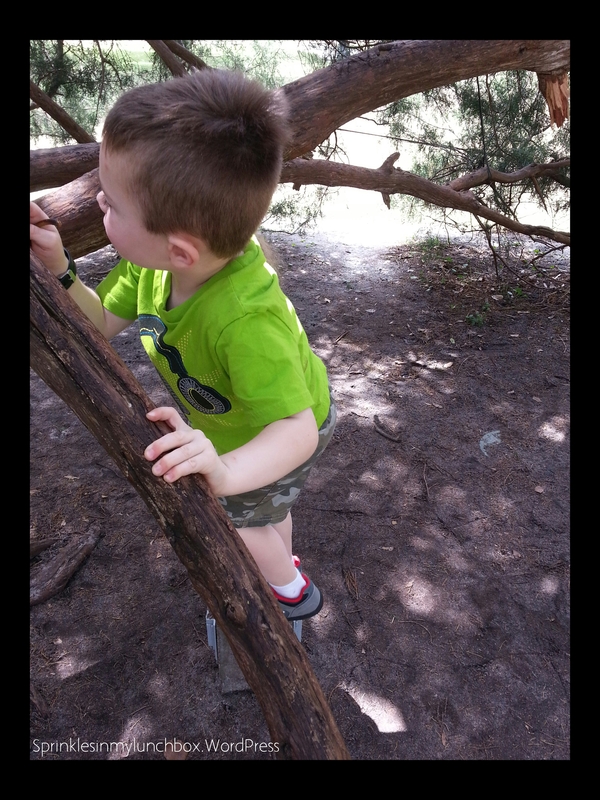 The boys loved hanging on it and climbing it. There was also lots of mud. Mud which must have looked delicious to my Smalls. He can’t resist putting everything in his mouth. This kid. He actually ENJOYED his first mud pie! I asked him to stick his tongue out so I could see the extent of his dirtiness. It went way back into his throat. He’ll do it again for sure. 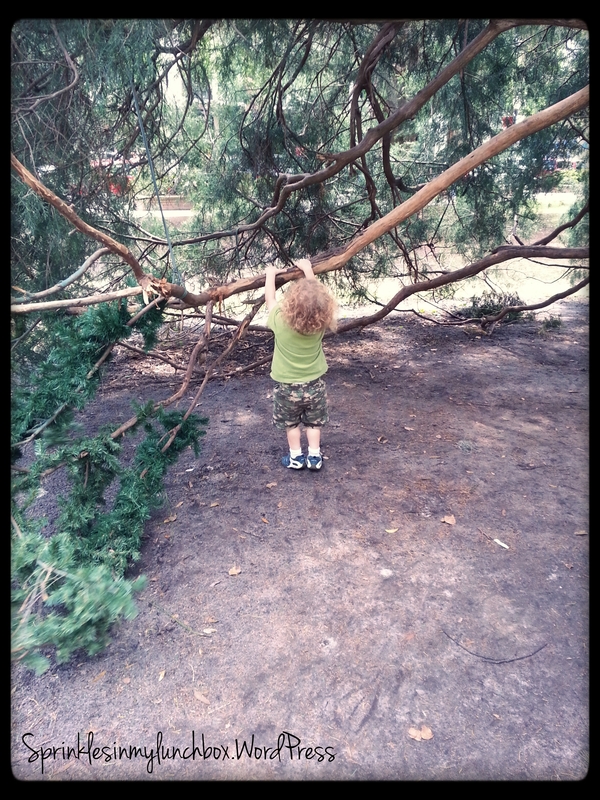 This park is also right by a train station (and the Farmer’s Market we go to). 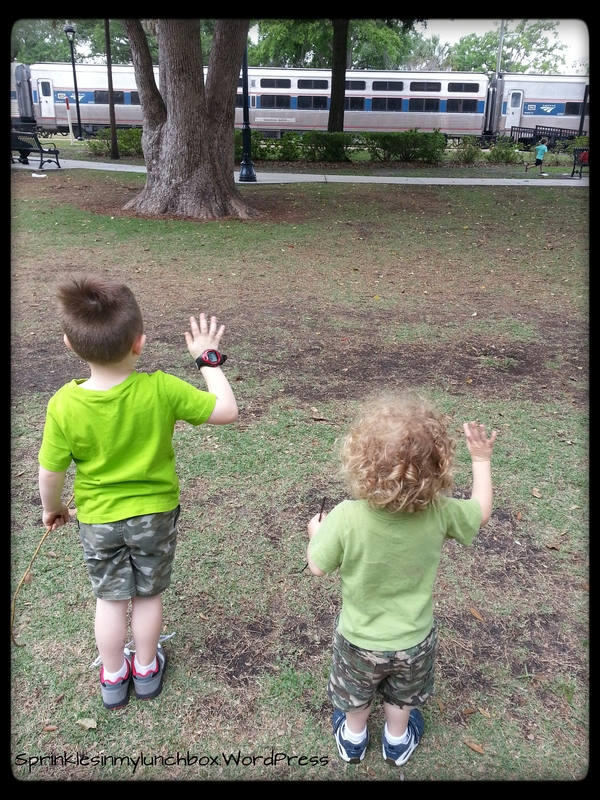 My boys LOVE a train. They watched as it pulled into the station, as people disembarked, embarked, and as it left the station, waving the whole time. Choo Choooooooo! 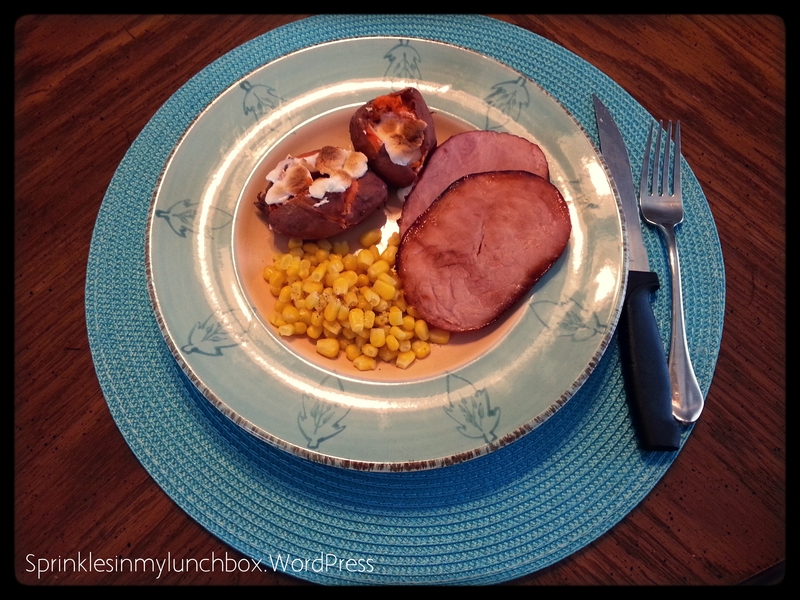 Dinner was ham! Always a good-eating night in our house. I glazed it with cherry preserves and served it with marshmallow-covered sweet potatoes and corn. The next morning was a volunteer day at our church. We packed backpacks for girls who had just been rescued from the Human Trafficking Circuit. I love having my kids learn to serve others. That night, we took them to the grand opening of a new gelati/ice cream shop that opened right by our house. We love this place and used to travel 25 minutes to get to it. Now it’s only five. Yippee! 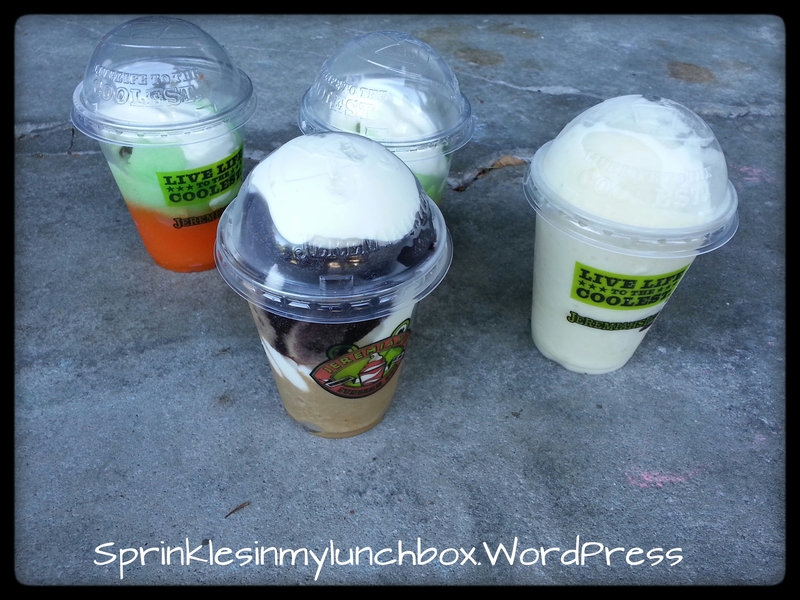 The boys shared a sugar free sour apple and tangerine mixed with vanilla soft serve, my husband got pina colada, and I got salted caramel and raspberry mixed with vanilla soft serve. Yum yum. 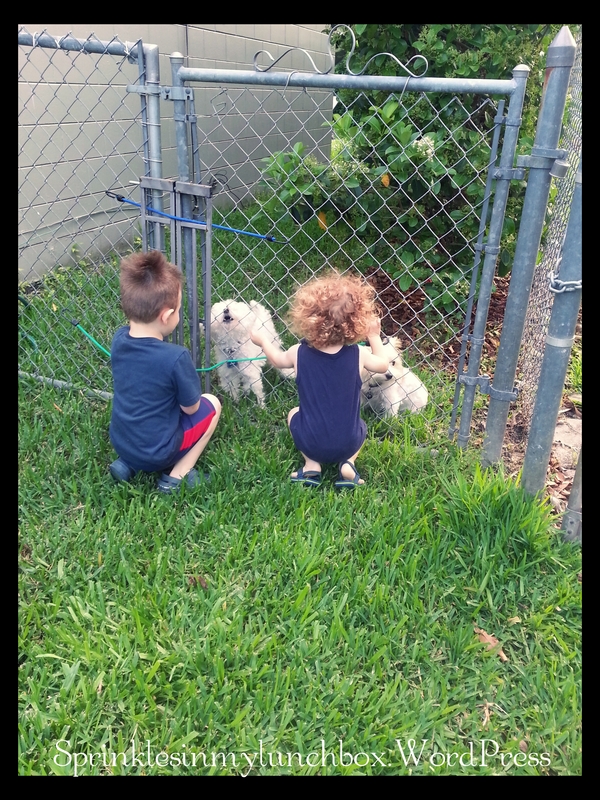 Then the boys played in the yard until bedtime. Smalls is really good at doing somersaults. Bigs is too now, but he wasn’t as much so when he was Small’s age. So Smalls does them everywhere – concrete, grass, whatever. That’s probably why he has a black eye right now, poor fella. I’d prefer him to do it on grass. On Sunday, after church, I made a one-bowl chocolate cake for my Mom group the next day. It was easy to put together and delicious! I’ve used this recipe before and it always comes together this easily. 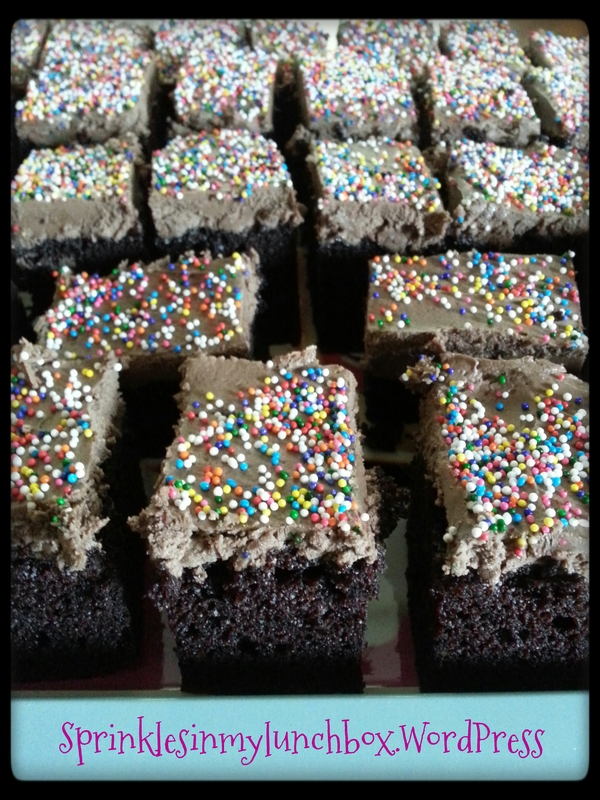 Fudgy, dense, moist chocolate cake with a rich, cocoa-y, fluffy, chocolate buttercream. It was a hit with my church group. I brought only two teeny pieces left. 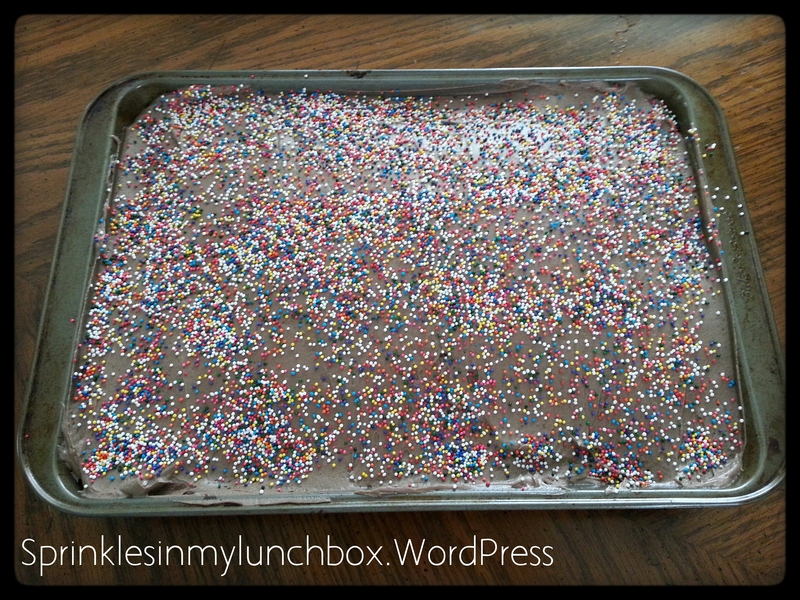 And it fed a lot – it was a 9×13 pan. 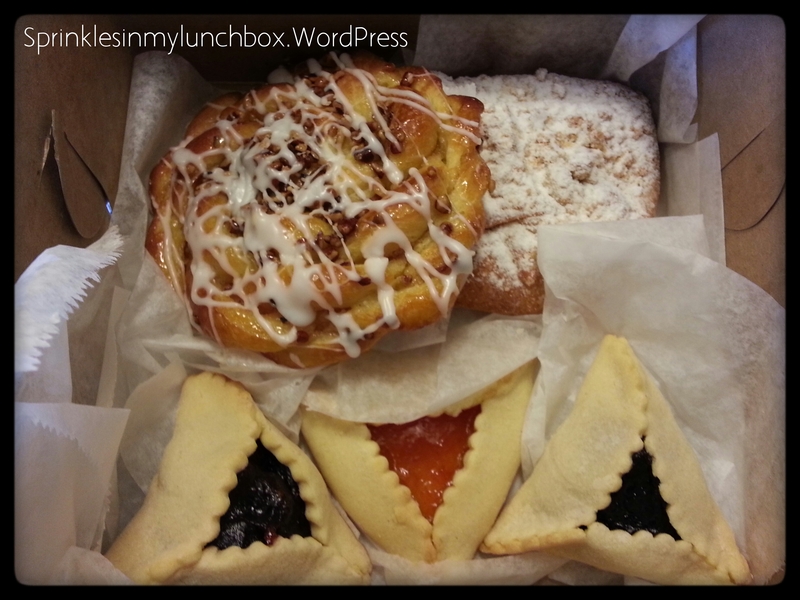 On Tuesday morning, my wonderful neighbor brought me some Jewish pastries from a local bakery. She got me three different kinds of hamentashen – raspberry, apricot, and prune. All three were delicious, but one flavor stood out to me. The raspberry was incredible! She also gave me a cream cheese roll and a nut bun. All delicious! 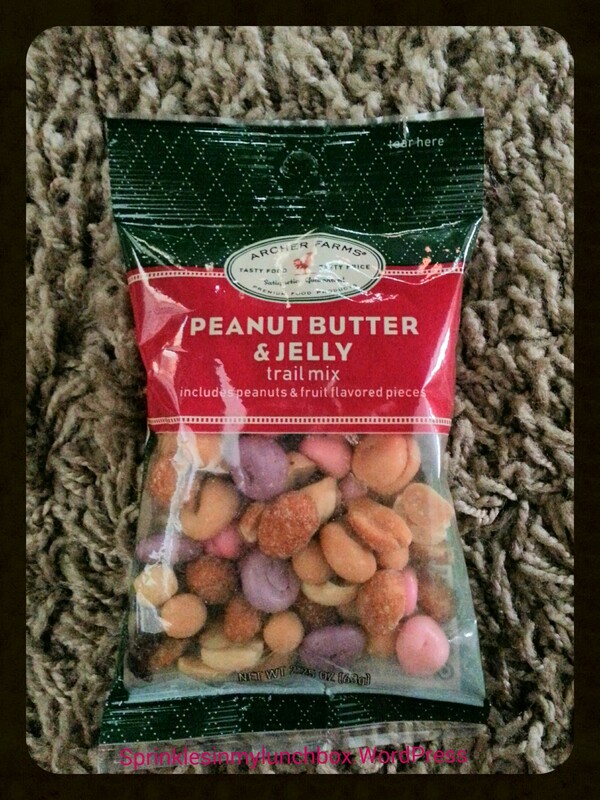 Food gifts are the best! That was a nice treat after taking my boys to their first swim lessons of the season (and Smalls first ever swim lesson). They are four times a week for about six weeks. Tuesday night, my husband had a doctor’s appointment after work. 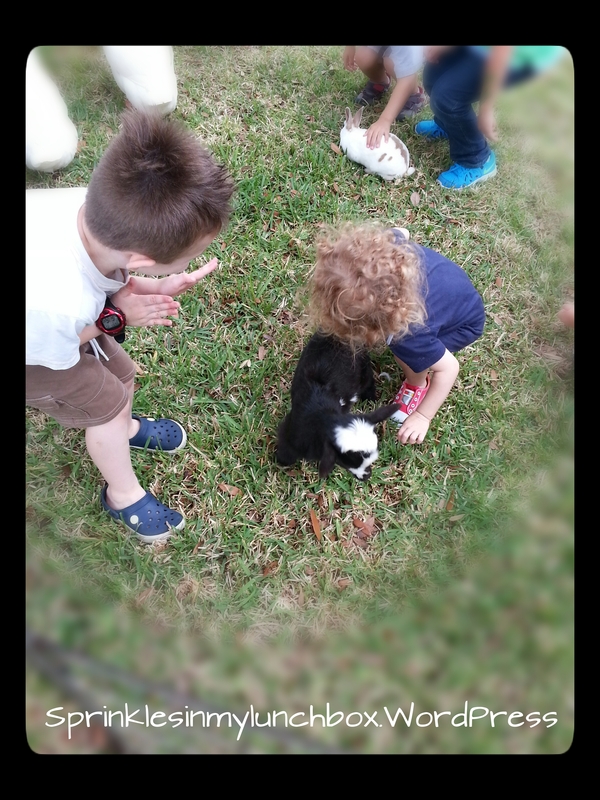 It also happened to be Family Night at Chik-Fil-A…with goats. And bunnies. And ducks. And chickens and roosters, too. And an egg hunt! Yes please! Anything to get me from dinner time to bath time, when I’m by myself with the kids, I’ll do! This brings me to the Easter egg hunt. Smalls and Bigs were the only ones in the hunt area at that exact moment. Each kid was allowed to pick up 10 eggs. Well. Smalls stomped (with gusto) on about 14. Not a gentle tap of the shoe, but like a ground-shaking sort of stomp. The type that breaks eggs. :/ At least he wasn’t doing that to the animals. I should be thankful. He continued the stomping habit when Bigs brought some hard boiled eggs he’d dyed at school. I had his little basket on the hood of my truck and the wind knocked it over and everything fell out and Smalls zeroed in on the eggs stomping them to their sad demise. 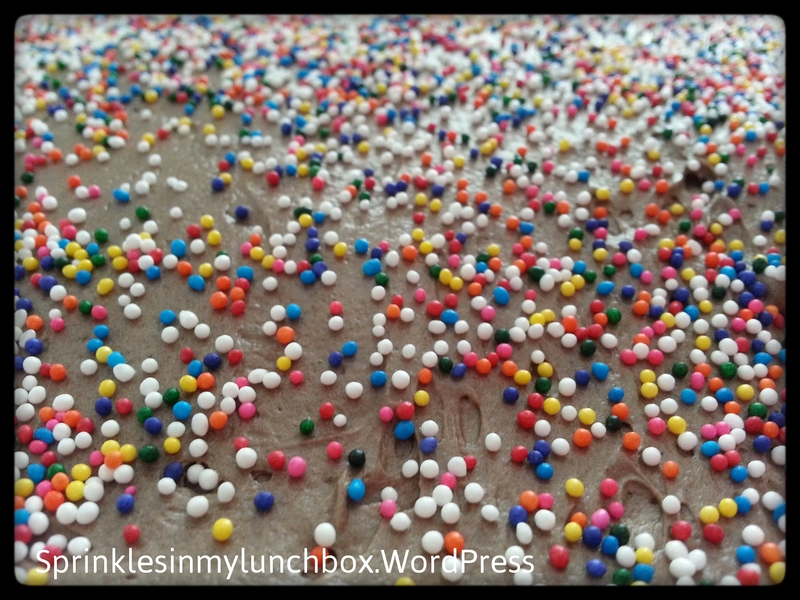 Sesame balls (if you know me at all, you know my obsession! 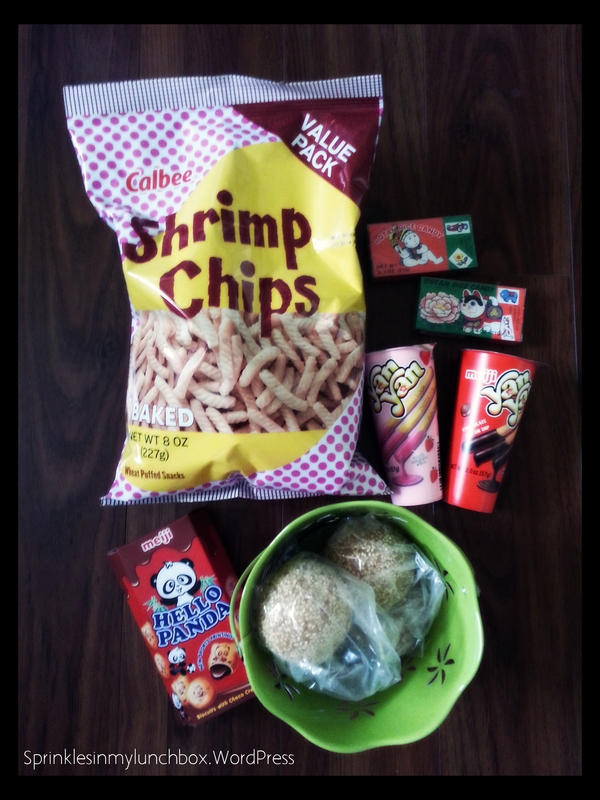 ), shrimp chips, some rice candy, Pockey, and Hello Panda treats! All from my favorite Asian grocery! For me, the best kind of Easter basket is the one filled with giant sesame balls. 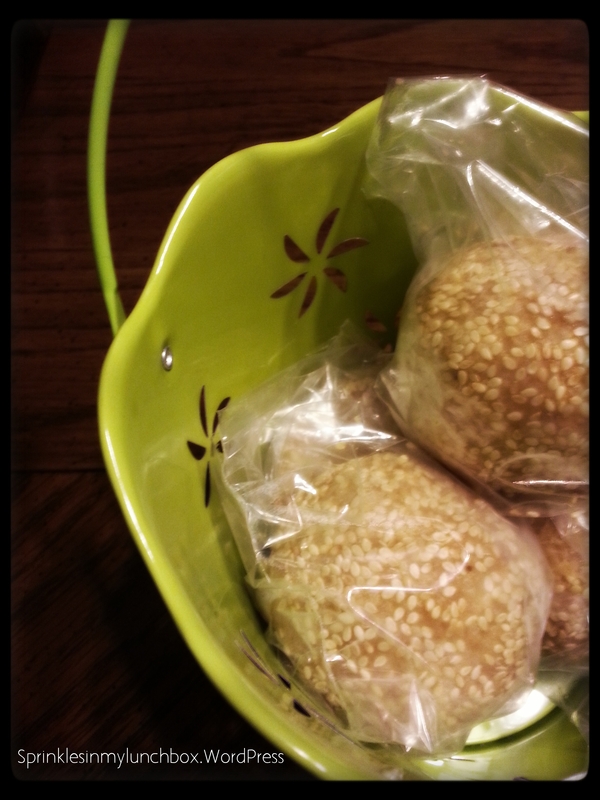 If you’ve not tried a sesame ball, I encourage…implore you to try one. And then let me know if you like them! 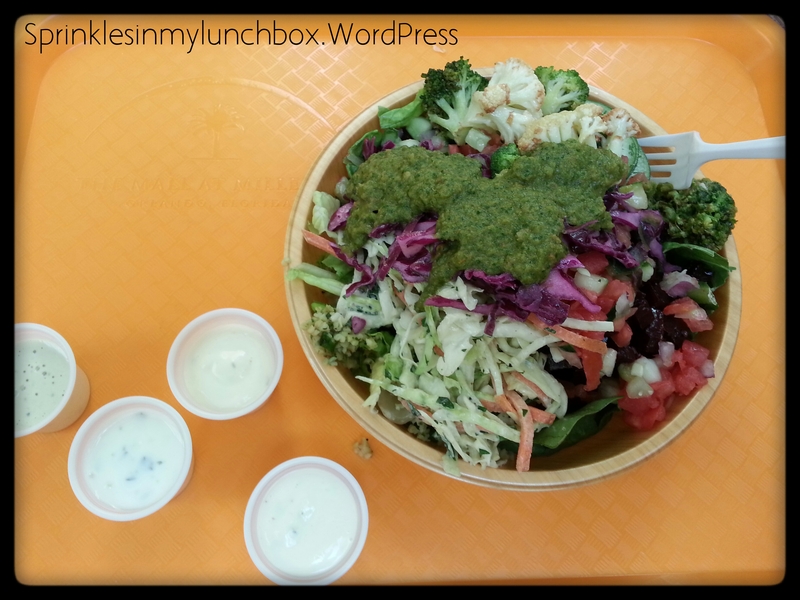 For lunch, I had a salad from a vegetarian Mediterranean place. Loads of veggies, lettuce, spinach, beets, tomatoes, broccoli, cauliflower, carrots, cous cous, cabbage, garlic, and cilantro. My kind of salad! 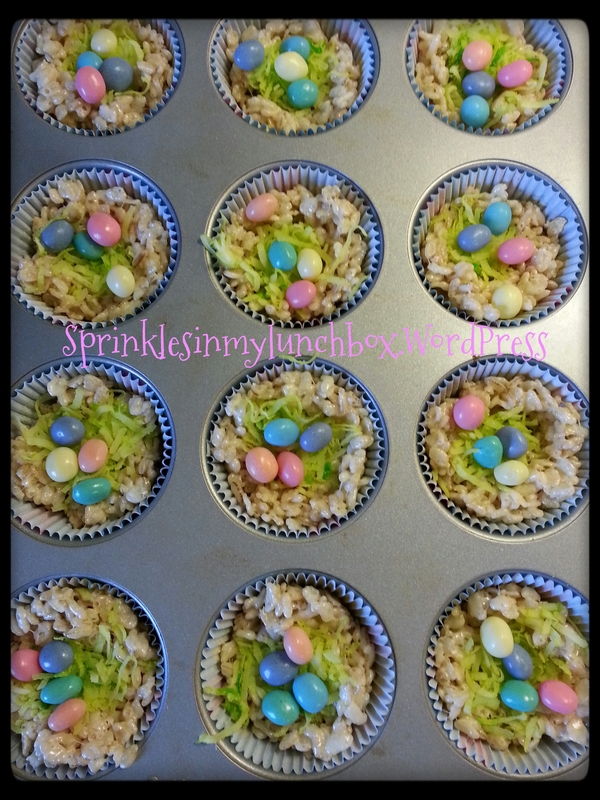 Thursday, after swim lessons and dropping Bigs off at school, I made treats for his class. 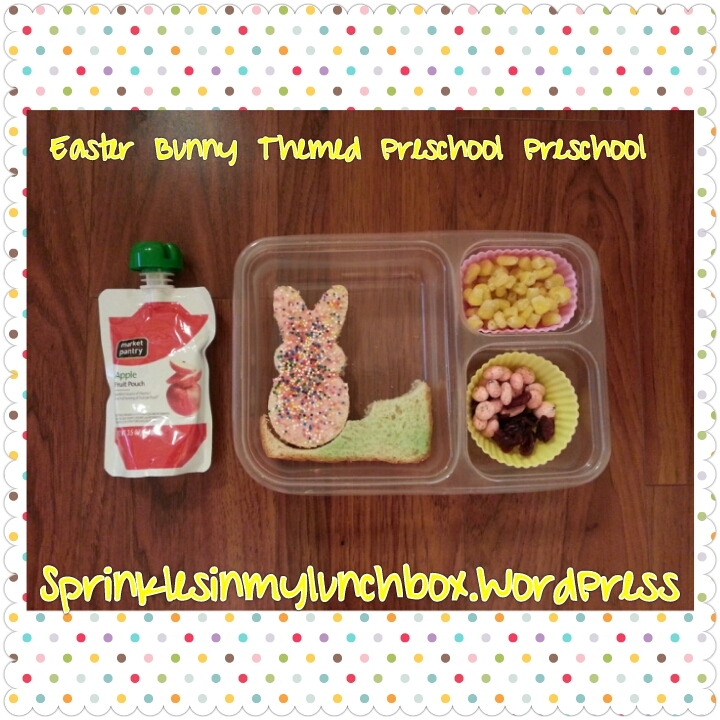 His wonderful teacher asked me to make something Easter-y. I love love being asked to make stuff! 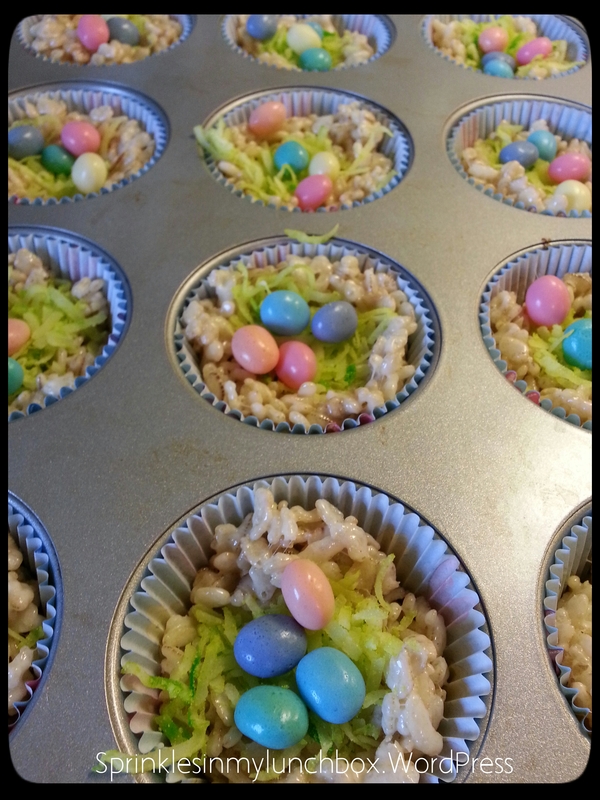 I decided to go with gluten-free rice krispie treats, shaped to look like little Easter baskets. Bigs has a friend in his class who is gluten free so I work closely with her Mom to make sure all the ingredients are free of anything that could cause a reaction. It’s so fun to have a challenge! And a plus is that my husband can eat and leftover treats I make (when also made dairy free). 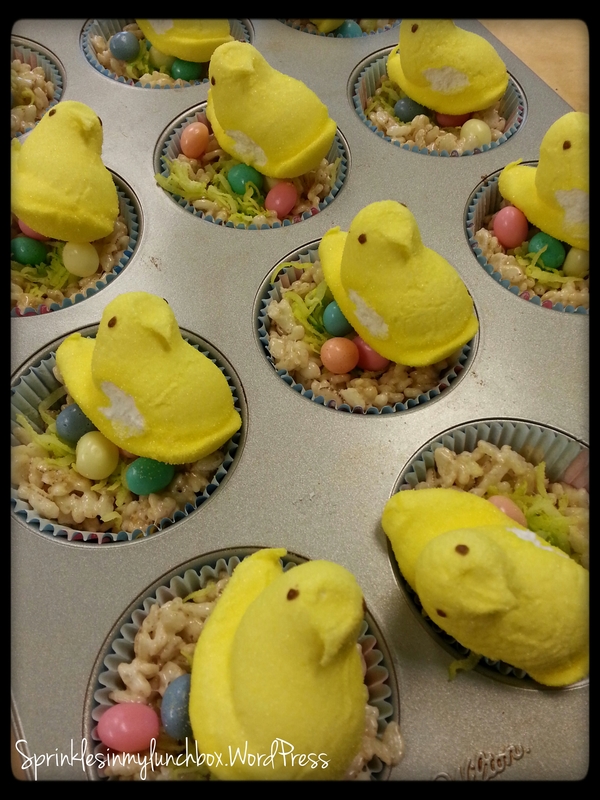 I made GF rice krispie treats and formed them into cupcake wrappers (Peeps!!) 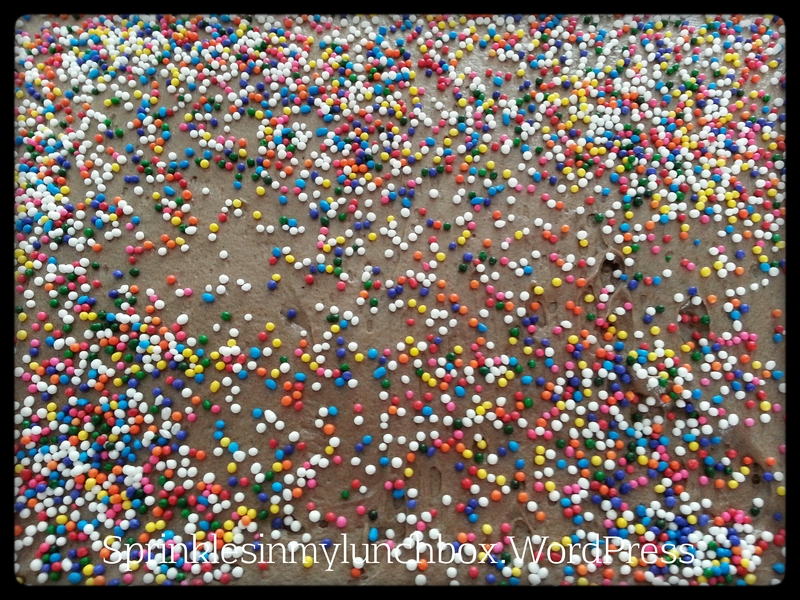 in a cupcake tin. I made a little dip in the center to hold little treats. While those were setting up, I dyed some shredded coconut green to act as the grass. I added the “grass” and then some GF jelly beans. They came out so cute! But I knew what would make them even better…. 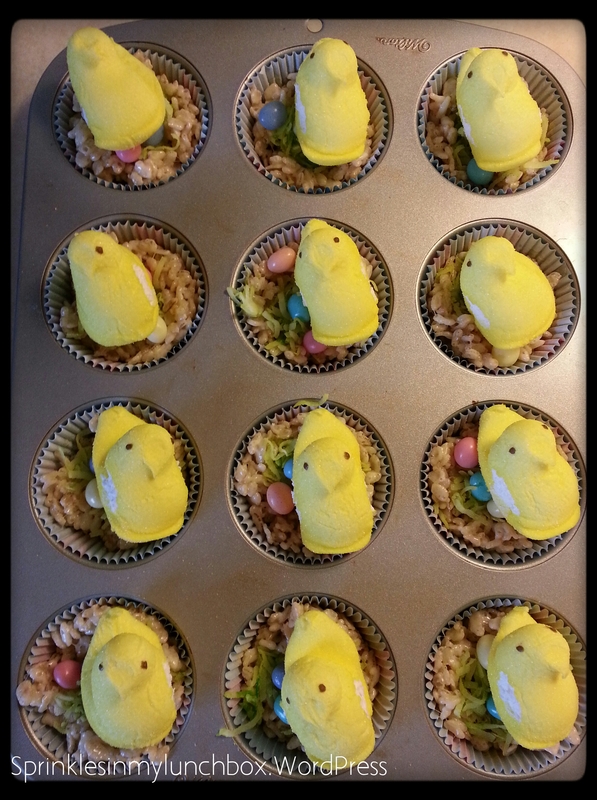 Don’t Peeps always make stuff better? I’ve found that most people have very strong feelings about Peeps. They either cannot stand them or they are obsessed. I’m obviously in the obsessed camp. They were a hit. Mostly. I’d say with confidence that most of the kids thought the coconut was not a good addition to the dessert, as a whole. Sometimes I get too fancy for kids. 🙂 It was a lot of fun making them though!! 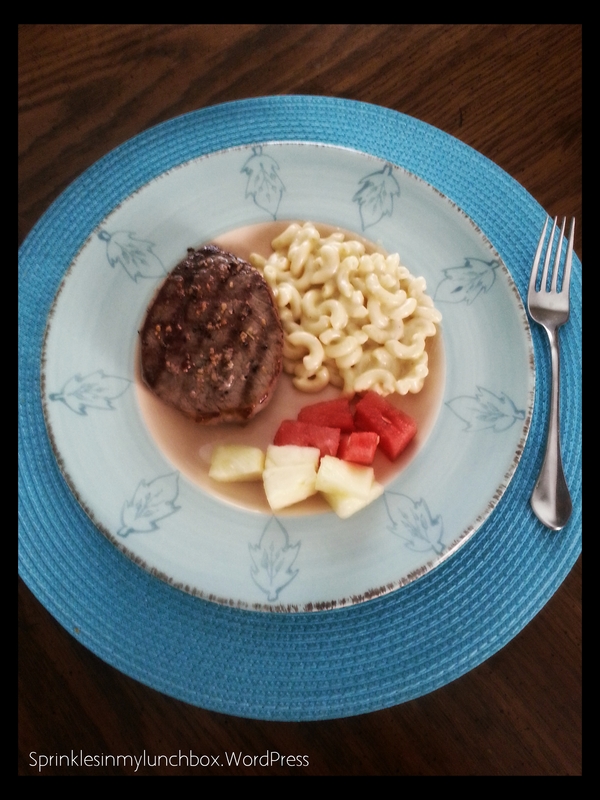 For dinner on Thursday, I made steak and homemade macaroni and cheese (husband got brown rice). The macaroni sauce (a basic roux sauce with cheddar added) was extra creamy. I served fresh watermelon and pineapple with it. Smalls ate none of it, Bigs ate all of it. It’s always a toss up! I thought it was good. The boys played in the yard until bedtime again. Whew. We are all caught up. I hope you all are having a blessed Holy Friday. Bigs and I have been discussing Jesus and his painful death a lot. He knows that Jesus went through all of that to save us and to give us eternal hope. I hope you know that too. Bigs had a Nocturnal Animal day in his classroom this past week. They read a book about a mouse. 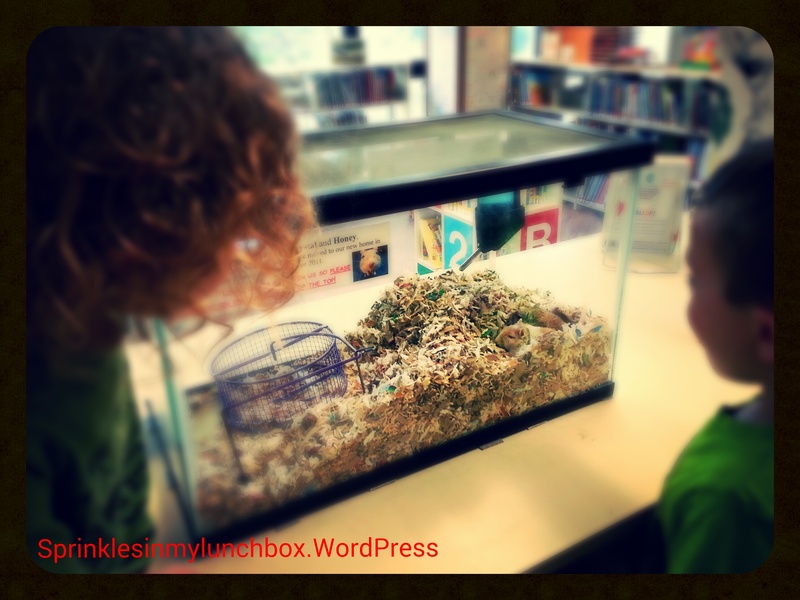 One of River’s best friends and her two sisters have mice and brought them in for the class to see. I couldn’t for the life of me find my mouse cookie cutter… or even be too sure that I had one! Sooo, I went with the owl. They’re nocturnal, right? I hope I at least got that fact correct. I made an owl out of a PB&J (I asked Bigs if he was sick of PB&J at school and he said no) and made the crusts into his little branch. 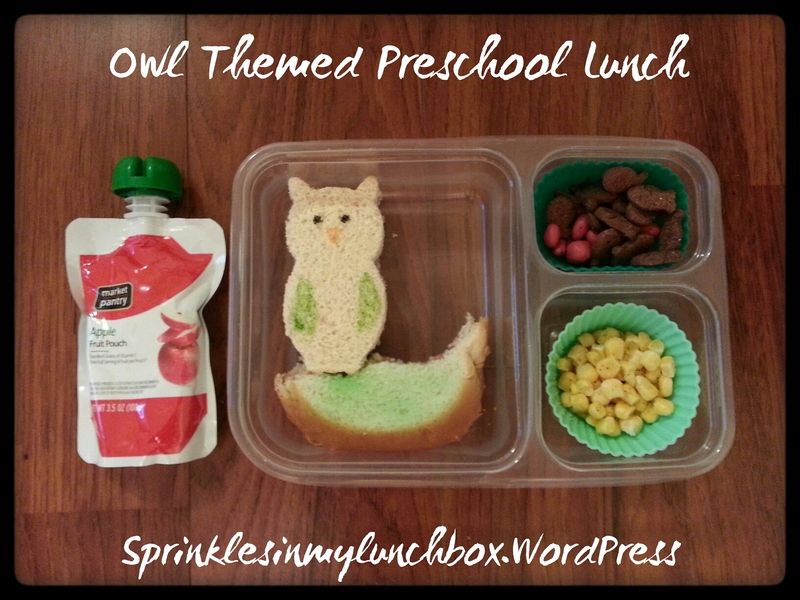 I also packed an applesauce squeezy fruit, some seasoned corn, and some cherry yogurt raisins and chocolate goldfish for dessert. Remember that song from Sesame Street? When I went into my bathroom last night to take out my contacts and wash my face, I saw something that seemed both out of place and right at home to me. 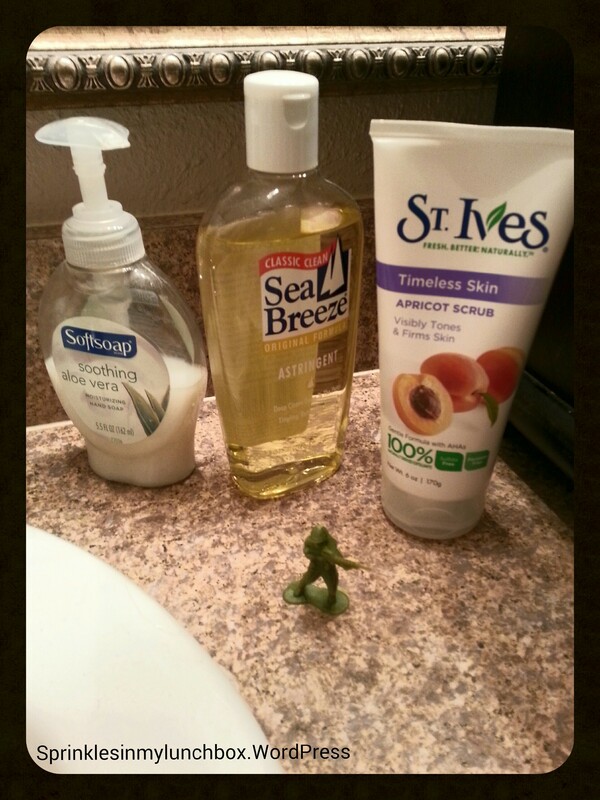 Amongst all my face washes and astringents, contact case and cleaner, soaps and scrubs, right next to my jewelery box, was one of my sons’ little Army Men, just sitting, paused, ready for battle, should I engage him. It made me giggle, not only because it was funny to me, but also because another friend posted on Facebook that very day about the trail of things her own kids leave behind. A LOT of the things the kids leave behind in a trail get in the way and can be and are annoying – shoes not put back in their correct places, toys pulled out so that my house looks like a Toys R Us threw up in it, stickers that have lost their stick on shirts and skin, but for some reason stick really well to my wood floors, dried up drips of food and drink peppering that same floor, crumbs that would make Hansel and Gretel (my inspiration behind the name for my dog, Gretl – because I would name my dog after a girl who went to a candy house) proud, enough books to fill a library and a huge bookcase, but aren’t in that bookcase and instead are in every room on the floors, pages from books that Smalls has ripped out (we are working on respecting literature), little, tiny footprints from little, tiny, wet feet, fresh out of the bath, little things that should be chucked in the bin but aren’t because they are tiny, special, little treasures to my Bigs and Smalls. These are the things that are littering my floor. Does the OCD side of me want my china cabinet to have pristine, crystal clear, fingerprint-free glass? Yes. 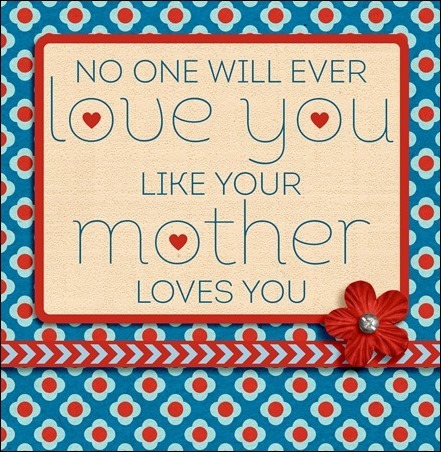 But the Mommy side of me always wants those little prints there, and on my front windows, and in the dirt on my truck. And all those things that have taken over my home… I will miss. When they aren’t there, I will want them back. I will look very fondly on these days. I want to keep those reminders of my two precious blessings, those memories forever. So while I’d love to someday have a house that looks like it belongs on the pages of Southern Living, I’m going to tuck that dream away for a little while. For now, I’d love nothing more than a house that looks and feels like there are two very loved boys living and thriving inside of it. Life is so very precious. Moments come and go so quickly. The days of having your small children at home are so short compared to a full life. I am going to enjoy them, embrace them, and welcome them.